I've run out of wall space to display my prints and have been looking for a way to display prints and for a way to give sets of prints to family and friends. After a great deal of searching both on the web and in stores, I came across the Folio covers offered by Dane Creek Folios. It is the perfect solution for my needs. A folio is a collection of up to 10 prints on letter size paper. The prints are then placed in a folio cover provided by Dane Creek to produce a professional looking package of prints and a nice looking cover. You can see examples at Dane Creek. 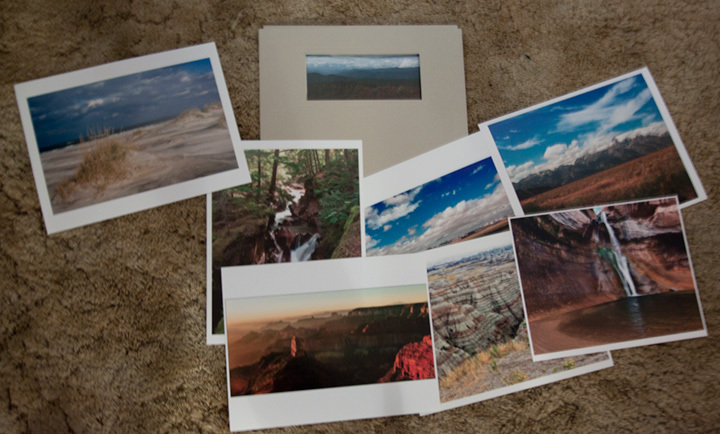 I've put together folios of our Southwest trip, a collection of National Parks, and a general a collection of photos from many of the places we've been. These provided very nice gifts for friends and family. I'll post each of these folios over the next few days. I'm also using the folio idea to organize photos for my wife and I to enjoy. So check them out. Travels with Nessie Home :: Site Map:: Contact webmaster@ncsparks.com-email us:: Copyright Leslie Sparks 2006, 2007, 2008, 2009, 2010, 2011, 2012,2013,2019:: Last modified: January 17 2012.